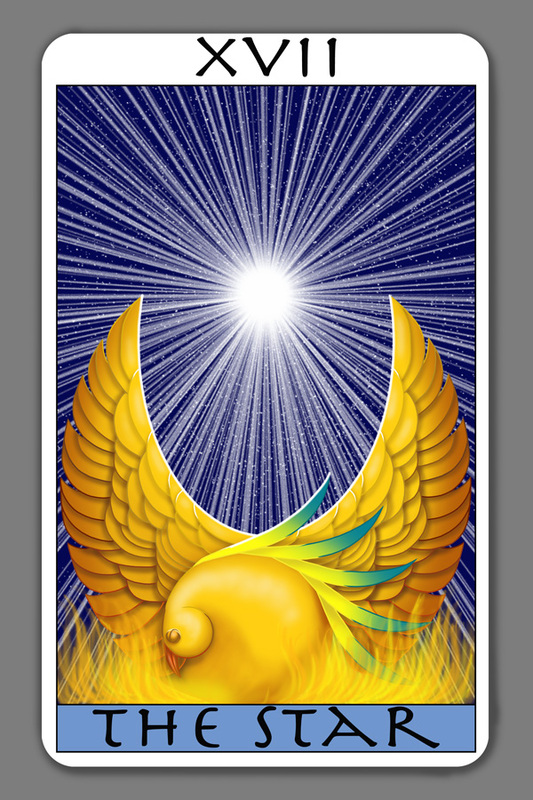 Rising from the flames of destruction, the golden phoenix, wings stretched to the heavens, prepares for flight into a new life, into new beginnings. Above her, blazing in the blue night sky, the star casts its light. The star is also about both destruction and rebirth. From the energy of the star, all life grows. But, in its end, the star will destroy all that is about it. The star, in its cycle, ebbs and flows, until finally, exploding in a burst of energy, all its matter is flung into space. This image is balanced, and yet dynamic. 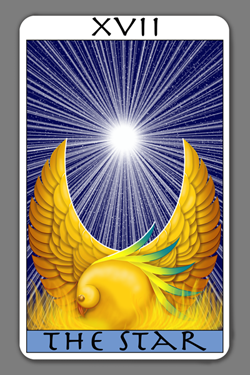 The traditional meaning of this card is "Hope, courage, inspiration." No destruction is final. The star is a point of hope for better things in the future; a bright place of hope in the darkness of the universe.